Keep your return address labels simple, sleek, and sophisticated with this personalized gift for him or her. This would make a fantastic gift idea for occasions ranging from housewarmings to birthdays. 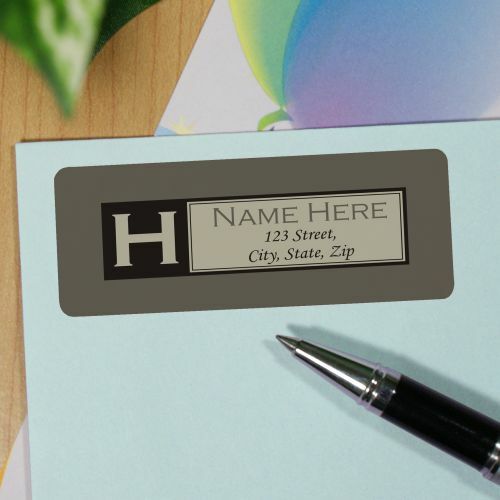 Initial Return Address Labels measure a standard 1"H x 2 5/8"W. Free personalization of single initial, any name and two line return address is included. Address Labels are available in various quantities. Label Size: 1" x 2 5/8"
Additional Details This sleek return address label is one of many varieties that we offer here at GiftsForYouNow.com. This design is sleek, classic, and it will never go out of style. For a more funky design, look at our Personalized Chevron Address Labels.